Snapture Labs launched their SnaptureFlash product, which promises to bring an external Xenon flash to the iPhone—one of the first external accessories to work with an app—but it has a catch. 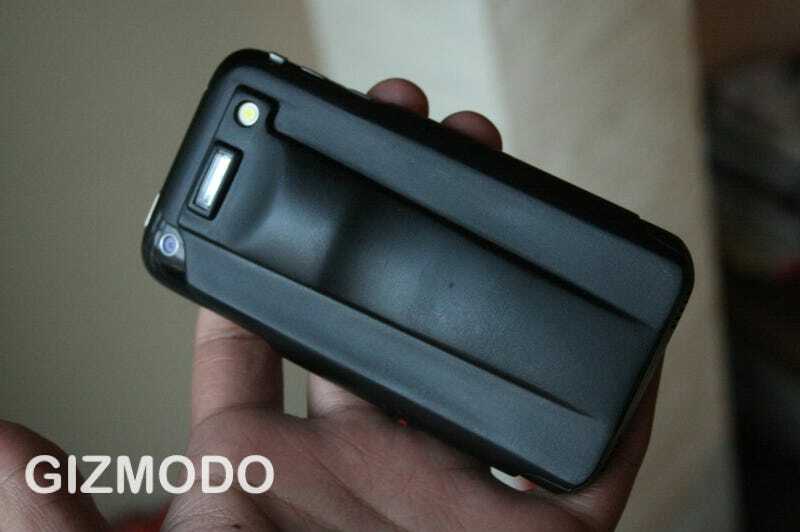 The SnaptureFlash product is roughly the size of any other iPhone case, which is to say its pretty slim and light. It adds 3/8-inch or so of length to the bottom of the phone, but they included passive speaker amplification down there so it's not a complete waste of space. As far as hardware goes, it packs in a xenon flash, which can provide 50,000 lux brightness ( vs the 500 lux of an LED "flash"). It also has an additional LED bulb that can be used for video recording or a really dim photo flash. Unlike other flash products, it works directly with the Snapture software. Getting the timing down between the phone camera, Snapture app and SnaptureFlash was the trickiest part, according to Bowei Gai, one of Snapture Labs' founders. But here's the catch. For the time being, the SnaptureFlash will only work with the Snapture app and any other jailbroken apps that have the proper drivers—no official apps could support the hardware without breaking the app store agreement. Jay "Saurik" Freeman, the man behind the Cydia Jailbreak community and Cycorder video app, was ecstatic about the potential of the Snapture Flash, and the numbers of jailbreak supporters that would be potentially interested, but still wasn't sure how apps like these could be officially approved. In terms of performance, the SnaptureFlash is still a mixed bag as it's a work in process. When I saw the SnaptureFlash in action, the quality of photos tended to be inconsistent. The photos above were taken with the hardware (one without flash, immediately followed by one with flash) Sometimes the photos looked really good, especially if it was really dark. But if the camera managed to pick up another light from somewhere, sometimes the photos would come out blue, or overexposed. Granted, since this is still in development, it can be fixed with proper calibration and programming, but it's worth noting.